The Colorado Boulevard Healthcare District (CBHD) Board’s final meeting of 2011, on December 4, was dedicated to a review of the site’s conceptual plan and a new presentation on the residential component. Material presented at the last couple of meetings is now available online (site plan and renderings). In response to lingering citizen concerns, project presenters reiterated that the Sembler plan has half the density of the original Shea plan, and less overall height compared to the Health Sciences Center. The two Big Box retail pads are required for economic viability. Attendees were reassured that the Nurses Dorm and Quad will receive historic designation. 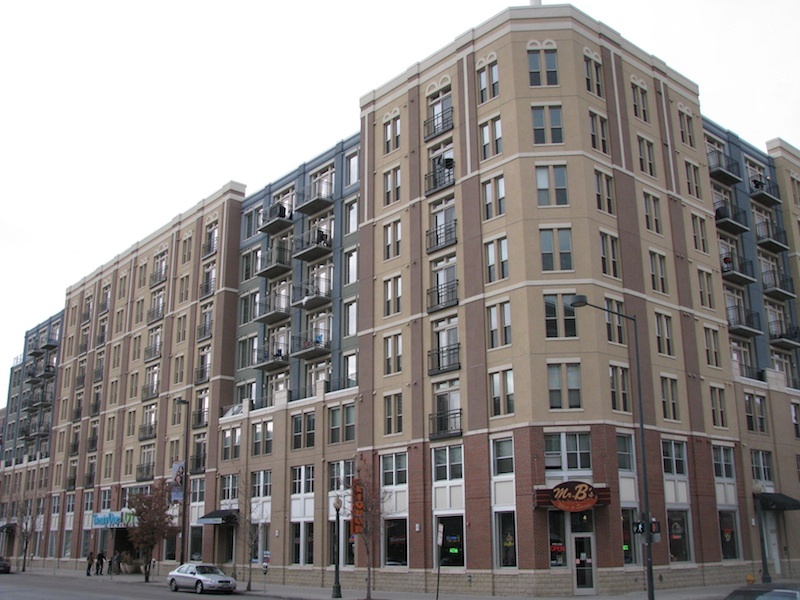 And, that the quality and character of the development will be appropriate to the surrounding neighborhood. The new report was a presentation by Alliance Residential on the residential part of the project, mapped to the left. Alliance specializes in luxury rentals. Its portfolio in Denver includes a finished project at 2101 Market Street and one in the works in the 2100 block of Blake Street just to the north. For 9th and Colorado the plan is for three buildings of 3 or 4 stories each. This amounts to 410 units at an average size of 918 square feet. All units will be rentals. About 55% of the total will be one bedroom flats and 35% will be two bedrooms. The remainder will be 2 bedroom/2 bath townhouses along Clermont Street. The average rent will be in the range of $1300-$1450 per month. Amenities will abound, including a pool, fitness center, wifi café, and clubhouse/meeting room. The pool will be in the courtyard of the northwest building and offer views of the Quadrangle. 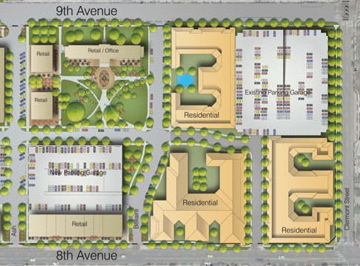 A pedestrian passage between two housing blocks will connect the residential piece to the southeast corner of the Quad (center of the map). Alliance imagines that this passage will serve as a public space for block parties, farmer’s markets, and other social gatherings. It will feature art installations and allow people to linger. As we’ve noted in previous posts, there are many admirable features in what Sembler and Alliance have proposed. The description of the residential piece generated additional concerns among neighbors about traffic, especially as it concerns the Birch Street access to the Parking Garage (Birch Street extends north from 8th Avenue in the lower right hand corner of the map). The developers emphasize that this is still just a concept that’s subject to the General Development Plan and other design guidelines. 1. I’m hoping the downsizing has to do with economic worries and not just a bad vision; this just looks like suburban sprawl in central Denver. 2. What an absolutely horrific, suburban (emphasis on the sub) design in one of the most important urban corridors in Denver. Shame on this NIMBY neighborhood not being to stomach [sic] anything over 4 stories in an area that already has mid-rises. Shame on Sembler for peddling this unsustainable, sub-par strip-mall layout. The only bright spot could have been the new road connections, but alas, even that was bungled. There isn’t a single road connection that can take you directly from 8th to 11th. The CBHD Board meeting schedule has been set for 2012 and these meetings will likely continue to fascinate those interested in the dynamics of urban infill planning in Denver.